SYRACUSE, N.Y. - The State University of New York College of Environmental Science and Forestry (ESF) will celebrate its 1999 Commencement Saturday and Sunday, May 15 and 16. ESF will confer some 350 degrees: 310 bachelor's degrees, 35 master's degrees, and five doctoral degrees. Among the honorees will be anthropologist Marilyn Wakeland Hoskins, who will receive an honorary degree. The valedictorian for the Class of 1999 is Angelina Trombley of Stillwater, who majored in Environmental and Forest Biology. The salutatorian is Jessica Ross of Plainview, who majored in Environmental Resources and Forest Engineering. The college also awards associate in applied science degrees at its Ranger School in the Adirondack community of Wanakena. Forty-six students in the forest technology program will receive those degrees during a ceremony May 22 in the Wanakena area. Commencement weekend festivities in Syracuse begin with the annual Year-In-Review slide show hosted by the senior class. The show will be at 1 p.m. Saturday, May 15. It can be seen at that time in both Marshall Hall Auditorium and in Room 5, Illick Hall. A reception for degree candidates, their families and friends, and faculty and staff members will be at 1:30 p.m. in Moon Library. The college's traditional Commencement Convocation will be at 2:45 p.m. Saturday in the Carrier Dome at Syracuse University. Baccalaureate, master's, and doctoral candidates will be honored. During the convocation, Faculty Honors will be bestowed upon the top student in each of the college's discipline areas. On Sunday, a continental breakfast will be served at 8 a.m. in Alumni Lounge, Marshall Hall, followed by a recognition ceremony for advanced degree candidates. ESF's Commencement exercises will be held at 10 a.m. Sunday at the Carrier Dome, in conjunction with those of Syracuse University. Degrees will be conferred upon ESF graduates by College President Ross S. Whaley and ESF Board of Trustees Chair Curtis H. Bauer. Class Marshals leading the ESF degree candidates in the Commencement procession are Jeffrey J. Sturek of Johnson City, N.Y., a student in the Faculty of Construction Management and Wood Products Engineering; and Teresa L. Farrell of Waverly, N.Y, a student in the Faculty of Environmental Studies. During convocation, Faculty Honors will be bestowed upon the following students: Trombley; Ross; Jeffrey Burns of Lockport, Environmental Studies; Katherine Hargrave of Vestal, dual option in Environmental and Forest Biology/Forest Resources Management; David Kabza of Orchard Park, Construction Management and Wood Products Engineering; Matthew Lochansky of Poughkeepsie, Chemistry; Brian O'Mahony of Syracuse, Paper Science and Engineering; Karl Roecker of Bellvale, Landscape Architecture; and Jonathan Schroeter of Hamburg, Forestry. 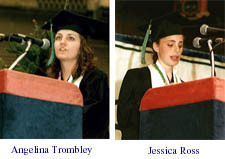 In addition, Angelina, Ross, and Burns will be honored as ESF's Class of 1999 Scholars. Founded in 1911, ESF serves more than 1,800 graduate and undergraduate students in its nine program areas: Chemistry, Construction Management and Wood Products Engineering, Environmental and Forest Biology, Environmental Resources and Forest Engineering, Environmental Studies, Forestry, Landscape Architecture, Paper Science and Engineering, and the dual program in Environmental and Forest Biology/Forest Resources Management.